The hutongs of Beijing offer a stark contrast and look-back in this now vertical city filled with dazzling skyscrapers. 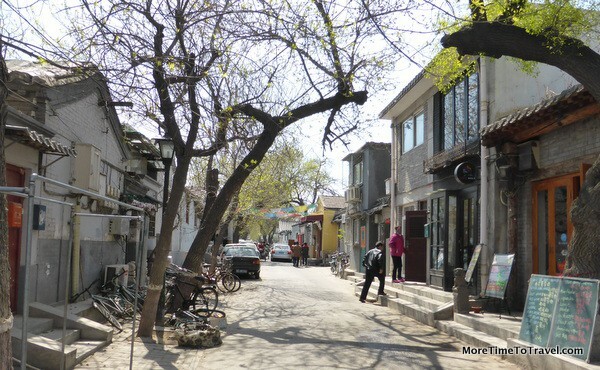 One way to get a glimpse of Beijing as it was centuries ago is to walk through its maze of narrow tree-lined streets and alleys, called hutongs. Although many Hutongs were bulldozed in the mid-1900s to make way for modern roads and buildings, it is estimated that about 4500 remain, predominantly in older areas of the city. Some date back more than 700 years to the Yuan Dynasty (1260-1368). Hutongs are passageways formed by the gray brick, tile-roofed housing compounds that line both their sides. Organized in orderly rows, the buildings create four-sided courtyards (called siheyuan) that once had gardens and wells at their centers. Many have been rebuilt several times and replaced by gray concrete block but retain their traditional look and character. Over the years, most have been subdivided and are now densely filled with multigenerational families. Some families have lived within these walls for many decades forming tight-knit communities. By tradition, doors are painted bright red, many flanked by lions or drum stones. The walls are typically gray because during the Ming and Qing dynasties (between 1360 and 1911), only buildings inside the Forbidden City were allowed to use bright colored tiles. The structures were all built facing south to maximize light. Most hutongs are named according to their location, history or the types of businesses once there. Originally known by word-of-mouth, names were later written down in the Ming and Qing dynasties. Now on some corners, you can find posted plaques that describe their history, often with English translations. Cars can wedge through the larger streets but pedals predominate, both to carry people and transport goods. Bicycles, pedicabs and sidecars (some with small motors) whiz through carrying tourists and locals. Residents within the cramped one-story buildings share communal kitchens and use public restrooms that often have no running water. Many still use coal firebricks for heat. Older residents enjoy the camaraderie of playing mah jongg, chess or cards, or simply sitting outside in the sun. They often rely on local vendors or peddlers for food and household goods. In recent years, young Chinese entrepreneurs have rented space in some hutongs to open Western-style cafes, bars, nail shops and small boutiques. According to a recent Los Angeles Times news report, rents in one such hutong (Nanluogu Xiang) increased by 50 times over what they were six years ago. Although gentrification has markedly changed the character of these neighborhoods, ironically, it has allowed some landlords and their families to sustain their way of life. The Chinese government is also taking steps to preserve some hutongs as protected areas to safeguard their cultural and architectural legacy. The New Yorker has a fascinating story written in 2006 by staff writer, Peter Hessler, who lived in an apartment building near one of these alleys for five years. Set out in the morning when the streets are less crowded. While you can visit by sidecar or rickshaw, walking allows you to set your own pace and peek inside doors and gates. Streets and alleys can be very narrow with uneven surfaces; take care to avoid stumbling or getting sideswiped by cyclists or motorists. Take a walking tour with a bilingual guide who can bring you to more traditional hutongs (avoiding ones filled with throngs of tourists), take you inside courtyards, and bring history to life. We highly recommend the Hip Hutongs Tour we took with Context Travel. Our docent Valentina Punzi, a scholar in Chinese and Tibetan studies, was amazing. This is outstanding, Irene! I’m so impressed with how you always immerse yourself in the local culture when you travel. The Hutongs remind me of the Snow flower book and how I imagined some of the scenery. Is this going to be published elsewhere? I’m in the midst of writing another piece on the hutongs. Stay tuned, Laura! Great photos of Beijing. Very colourful. I now want to learn more about hutong culture. Be sure to read the New Yorker article. It’s great! This tour of the hutongs of Beijing would definitely be a priority for me on a visit. How fascinating, particularly the bicycle conveyances! WHAT GREAT MEMORIES YOU BROUGHT BACK SINCE I SAW THE FIRST HUTONGS ABOUT 10 YEARS AGO, BEFORE THE DESTRUCTION OF MANY OF THESE DETERIORATING HOUSES. I WENT BACK A FEW MONTHS AGO AND SADLY, THERE ARE MORE HUTONGS BEING TORN DOWN. AND CONDO BEING BUILT THE 1ST TIME, I WAS ACTUALLY INVITED INTO ONE OF THE HUTONGS AND IT WAS EXPLAINED THROUGH AN INTERPRETER, THAT THE COURTYARD IS USED BY THE FOUR HOUSES AND OFTEN THEY PLANT FLOWERS AND VEGGIES. HOWEVER, SOME NEIGHBOURS AREN’T AS FRIENDLY TO EACH OTHER AND THERE HAVE BEEN TIFFS THAT GO ON FOR YEARS. REMARKABLE AREA. A MUST SEE. PROUDEST POSSESSION IS A FRIDG. YOUR PHOTOGRAPHY IS SUPERB. Thanks for visiting this blog, Barbara. We saw some refrigerators in the streets (shared by families) as well as fresh waters dispensers on corners. Fascinating and very comprehensive article about the hutongs of Beijing. Like you, I have always preferred walking thru the narrow streets and taking in the sights which abound at every turn. Great posting! Thanks! There are so many hutongs to explore. I would return in a heartbeat! I’m glad they are finally preserving what few remain, what a shame in the name of progress and development. This is a very interesting post about the hutongs in Beijing. I had been hoping to take a pedicab tour of some of them on my recent visit but didn’t have the time, though I did view some of the hutongs from the main streets. We missed the hutong when we visited Beijing. Very interesting! I think it’s good to remember that millions of people have very little and live a life of struggle. The humble homes of the hutongs show people who have learned how to be resourceful and hard-working — even playing games. The visions are bitter-sweet. Thanks for that great message. They also seem to have achieved longevity in the process. I would imagine their longevity is due in large part to their diet; rice, whole grains, lean fish, vegetables, probably little or no processed foods. I’m not sure of their diets but I know that a number of studies have associated longevity with strong social supports, like that found in the hutongs. This is super interesting, Irene. Once again, I’ve learned something I didn’t know. Love all the pics from your tour. It’s amazing how old some of the hutongs are. We can only hope that they won’t all disappear. Travel sure broadens our experience and understanding, doesn’t it? This is great and reminds me of the Portuguese ‘colony’ of remaining homes tucked away in Mumbai. Thanks for writing about the hutongs. I don’t know anything about Beijing except that it’s over-crowded, very vertical and smog-filled. Great to know that for now, these neighborhoods have survived. Wonder if the gentrification will save them. I hope so; I think the government is paying more attention to their historical significance, too. The hutongs are an interesting side of Beijing. I enjoyed meandering through them a few years ago in Beijing’s +40C summer heat! I took a great cooking class in one that has been totally renovated. The hutongs are a side of Beijing about which I knew virtually nothing before reading this blog post. Did you feel that you were intruding while walking though the neighborhood? I wouldn’t want to go without a guide who probably knows about which hulongs welcome tourists. Using Context Travel sounds like a good solution. Good question! It didn’t feel intrusive at all but we tried to be respectful. Having a Chinese speaking guides was great, too. She knew where to take us and what to see. This was a very interesting post and a fascinating glimpse into an ancient way of living. It’s amazing to think of people living in this way for so many centuries, especially when compared to the American lifestyle of cross-country moves and long distance family ties. Yes, living in the same place for generations fosters deep roots—something many Americans miss out on. I’ve taken two Context tours and think they do a great job incorporating the history of an area into the experience. Did you find the same on this tour Irene? I love the entrepreneurial spirit of using the buildings for new businesses and am glad to see that it is allowing some of the families to sustain the lifestyle of past generations. Excellent pictures… ! After 2 years living in here, I still get surprises every day! I worry, too, that they are vulnerable to developers in a society that has become so capitalistic.